Crazy for Contests: An Excelllent Christmas Morning Win for Me! An Excelllent Christmas Morning Win for Me! I had been really hoping to win tickets to see Bon Jovi! On Christmas morning while waiting for the rest of the family to get up I checked my email and saw this message that was delivered at 8:05 am! Merry Christmas Andrea, you're off to see Bon Jovi!! 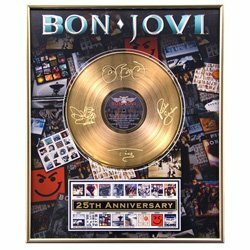 You've also won our GRAND PRIZE of the Bon Jovi limited Gold Autographed Album!!!! Fantastic...good for you...HAPPY NEW YEAR!